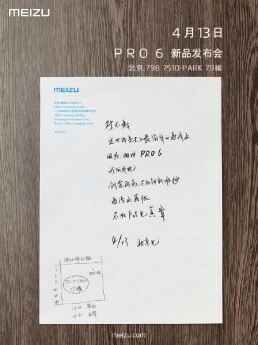 Following the recent appearance of the Meizu Pro 6, the company officially announced the phone will be revealed on April 13. The invite reveals the launch will be held in Beijing. We'll know officially what the Pro 6 is all about. Going by rumors we are expecting a 5.7-inch QHD Super AMOLED touchscreen, a 21 MP rear camera, a 5 MP front-facing snapper, Samsung's Exynos 8890 chipset, 4 or 6GB of RAM, and a 3,500 mAh battery. Just the other day Meizu announced the m3 note. It will be 5.2 inch Helio x25 , and 4G ram. This the resource in Chinese I received today by meizu mx5 nofications.. Which is directly from meizu. https://zinggadget.com/2016/04/08/&#39749;&a­mp;#26063;pro-6&#23448;&#26041;&#30.­..